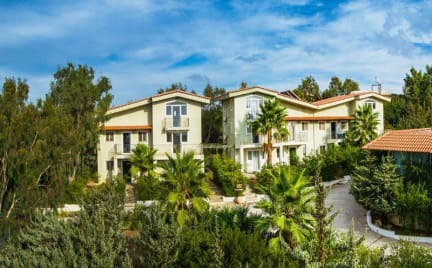 “The Small Village” outskirts of Mastichari of Kos island, built on seven asymmetrical levels staring at the Aegean Sea ,offers to its guests the atmosphere of a village along with the comforts of modern living. Warm Hospitality, Hotel Comfort & Privacy merge into a harmonious unity. 4 km from Mastichari, 4km from Antimachia, 10km from the airport and 26 km from the town of Kos. The menu is Mediterranean, and the majority of ingredients is organic, from the best farms of Kos countryside. Our beach is embraced by seashell rocks and serves as a shelter for seagulls. It may be accessed on foot. The powdery sand is gives the impression of walking on a thick carpet. In a certain region of the gulf one may take advantage of the beneficial qualities of clay. The northwestern winds that blow periodically create ideal conditions for surfing and wind surfing. Every Suite has the ability to accommodate 2-3 persons in one bedroom with double or twin bed(s), bathroom with bath-tub, hairdryer, open plan living- room with comfortable (convertible) sofa-bed, kitchenette with electric cooking rings and fridge, remote control air-conditioning, t/v. Stone terrace with table and chairs. Garden and /or sea view. Each Maisonette has the ability to accommodate 4-5 persons, in two main bedrooms, one on the second floor and one on the third floor of each building,( Access between floors is provided by an internal staircase) with separate Bathrooms with bath-tub , hairdryer. Open plan living room – with convertible sofa bed, kitchenette with electric cooking rings and fridge, remote control air-conditioning, t/v. Balconies with table and chairs. Sea view and /or garden view. Villa is a 3 level residence that gives you plenty of room for family, work or for traveling friends to share a villa and still have the privacy of separate sleeping areas. The ground floor features a spacious independent suite with a master bedroom and separate living room with a sleeper-sofa, a flat screen TV, a fully equipped kitchen and a dining area, bathroom with bathtub, Terrace. On the next level features an independent Maisonette with two private bedrooms, two en-suite bathrooms, living area with a flat screen TV & sofa bed, a fully equipped kitchenette and a dining area. Sea view and /or garden view. Cancellation policy: 72 hours prior to arrival, 1 night cancellation fee will apply in case of cancellation and noshow.